Results of a multi-client benchmarking study show that in spite of operational improvements, dimension lumber mills in the U.S. West have struggled to overcome the narrowing gap between log prices and lumber selling values. 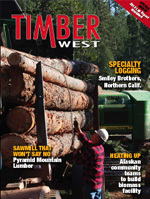 The study included 10 dimension lumber mills, the majority of which are located in the coastal region of Oregon and Washington where log exports to China and other parts of Asia have driven up timber prices and led, at times, to mill log shortages, says The Beck Group, the company that completed the study. The benchmarking study spanned the year July 2010 through June 2011 and examined a variety of operating metrics including manufacturing cost, lumber recovery, sales values, log costs, productivity, staffing levels, and adoption of technology. Mills have made a variety of improvements in recent years. When compared with results of a similar study conducted in 2005 (near the peak of the U.S. lumber market), the average sawmill has improved lumber recovery and productivity per man-hour by more than five percent each. In addition, the average mill has more than doubled the prices it receives for byproducts (such as chips and sawdust). Unfortunately, those improvements have not been enough to overcome the diminishing spread between log and lumber prices. In 2005, the difference between log cost (after accounting for lumber recovery) and lumber sales value for the average mill was more than $100 per thousand board feet. For the 2010-11 period, that margin had dropped to less than $50 per thousand, leaving sawmillers less than they needed to turn out. Making matters worse, most mills in the latter study have had to operate well below capacity, leading to an increase in manufacturing costs of nearly $15 per thousand board feet. Overall profitability fell by more than $50 per thousand board feet between the two periods, with most mills operating in the red for mid-2010-2011. Since the end of the study period in mid-2011, log export pressure has diminished and lumber values have improved modestly, but many sawmills continue to struggle as they wait on the dragging U.S. housing market to restore lumber demand and bring prices closer to historical norms. U.S. Forest Service Chief Tom Tidwell announced June 11, 2012, that the agency would add eight additional aircraft to its firefighting fleet to ensure that an adequate number of airtankers are available for wildland firefighting efforts. With these additional airtankers, the Forest Service has 16 large airtankers and one very large airtanker available immediately for wildfire suppression. Nine of the operational large airtankers are on exclusive-use contracts and include eight P2Vs and one BAe-146. The BAe-146 can carry 3,000 gallons of retardant or water. The agency has activated five CV-580 Convairs, one through an agreement with the state of Alaska and four through an agreement with the Canadian Interagency Forest Fire Centre. A very large DC-10 airtanker is also being activated through a “call when needed” contract with the owner, 10 Tanker Air Carrier of Adelanto, Calif.
Two other airtankers, CAL FIRE S-2Ts, will be staffed and available in California through an agreement with the state and funded by the Forest Service. The Forest Service is also arranging for five heavy helicopters, called Type 1s, to become available earlier than scheduled. The CV-580s are owned by Conair Group Inc., of British Columbia, Canada. CV-580s provide similar operational capacity to P2Vs as both can fly in all types of terrain, can carry approximately 2,100 gallons of retardant, and can operate from any of the agency’s primary or reload tanker bases. The agency can also mobilize eight military C-130s equipped with Modular Airborne Fire Fighting Systems and, through an agreement with the Canadian Interagency Forest Fire Centre, another three CV-580 Convairs. Additional aircraft are also available through U.S. Department of the Interior contracts. For the past 48 years, the U.S. Capitol Christmas Tree (CCT) has been a symbol of the National Forest System and a source of great pride to the state and National Forests from which the tree is chosen and delivered to Washington D.C.
For the 2012 CCT, Choose Outdoors, a national nonprofit based in Pine, Colorado, and the U.S. Forest Service will be working together to deliver the tree after a national tour with the themes of “Celebrating Our Great Outdoors” and the importance of sustainable forestry. Former U.S. Senator (Colorado) Ben Nighthorse Campbell will once again, as he did in 2000, drive the truck across the country. Current supporters include Mack Trucks, the National Association of Convenience Stores, Vail Resorts and the Aspen Skico, Kampgrounds of America, and many more. To find out how you can help, contact Bruce Ward, National Director of the U.S. Capitol Christmas Tree for Choose Outdoors, at (303) 917-1476 or bruce@chooseoutdoors.org.